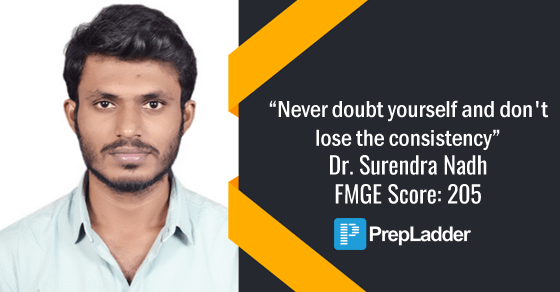 Prepladder congratulates Dr. Surendra Nadh on clearing FMGE June 2018 exam. We wish him all the very best for his career and future ahead. Hello. I am Dr. Surendra Nadh. I did my graduation from Guangxi Medical University. I scored 205 marks in FMGE June 2018 examination. Right from the starting and at least 5 months should be at your hand side. Written notes by yourself are the best way. Revision is the key to success like one must have to do a minimum of 3 to 4 revisions and a proper timetable has to be maintained to achieve that. Yes, PrepLadder did play a part in my success. The mock tests conducted by Dr. Deepak Marwah on PrepLadder platform were really very helpful. I scored 148 and 156 marks in the 2 mocks. I was more confident after participating in the tests. Yes, a study plan is a must to keep the preparations on the track. We thank Dr. Surendra Nadh for sharing his success story. More interviews from toppers follow soon.